Join thousands of others who receive this daily analysis of crypto markets & news in their inbox every morning - subscribe now. Private pension funds may be in more trouble than you think. In Q4 2018, these funds realized the second largest percentage loss in assets since the 1950’s and the largest loss since 2008. As Tavi Costa pointed out on Twitter, the more than 5% drop in assets leads many to believe that the retirement funds of tens of millions of people are likely to be exposed to a much higher degree of risk than previously understood. 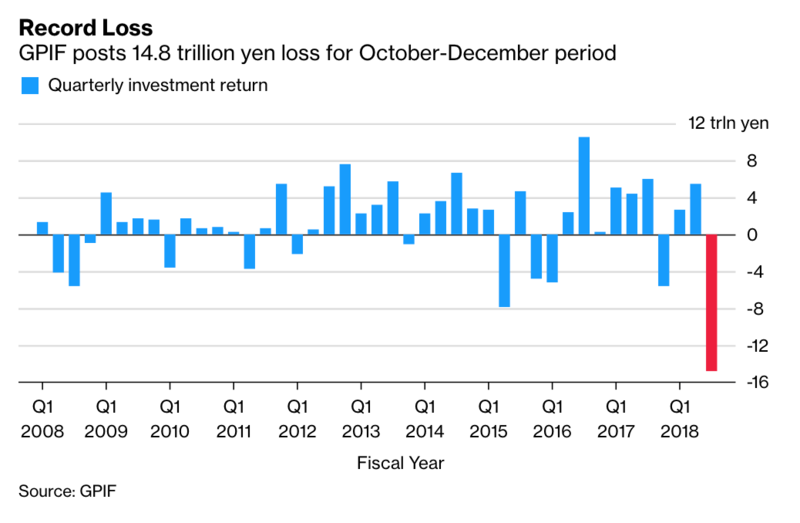 Take Japan’s Government Pension Investment Fund, the world’s largest pension fund, who has ~50% of their assets in global equities. During Q4 2018, they saw a 9.1% drop in assets, which is about $136 billion. Read that again….one of the most conservative capital allocators in the world has a portfolio that is constructed in such a way that they experienced uncommon levels of volatility and almost lost a double digit percentage of their assets in 90 days. 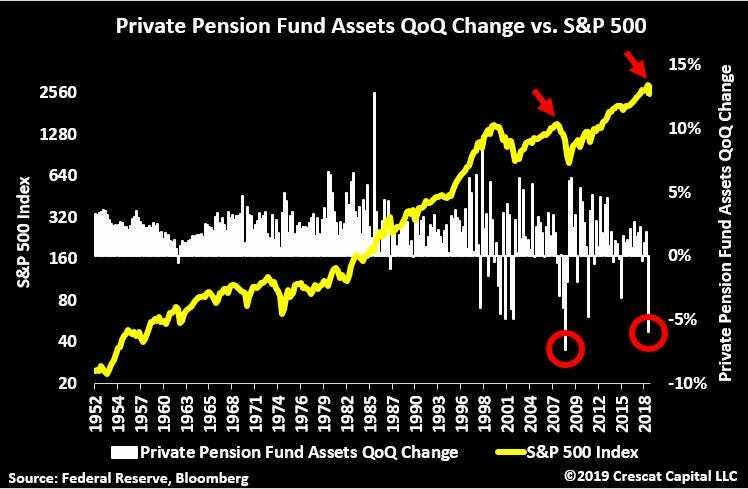 The highly concentrated equity portfolios of many pensions is a scary scenario that will turn ugly really fast when valuations begin to return closer to long term averages. So what should these institutions do? As I have been saying for months, they need to immediately evaluate the option of gaining exposure to Bitcoin, cryptocurrencies, and the blockchain industry. The assets have proven to be low correlation to date and have an asymmetric return profile. A simple 1% allocation has the potential to materially negate any losses that could be experienced through an equity market fall. In fact, the numbers are quite compelling. If Japan’s Government Pension Investment Fund had moved to #GetOffZero and gain exposure to cryptocurrency through our Digital Asset Index Fund last year, they would have seen a 46% return on the investment year to date or 0.46% increase in overall portfolio performance. With these trends playing out over the next 2-3 years, my anticipation is that the Digital Asset Index Fund will continue to drastically outperform the S&P 500. (We were literally willing to bet on it). 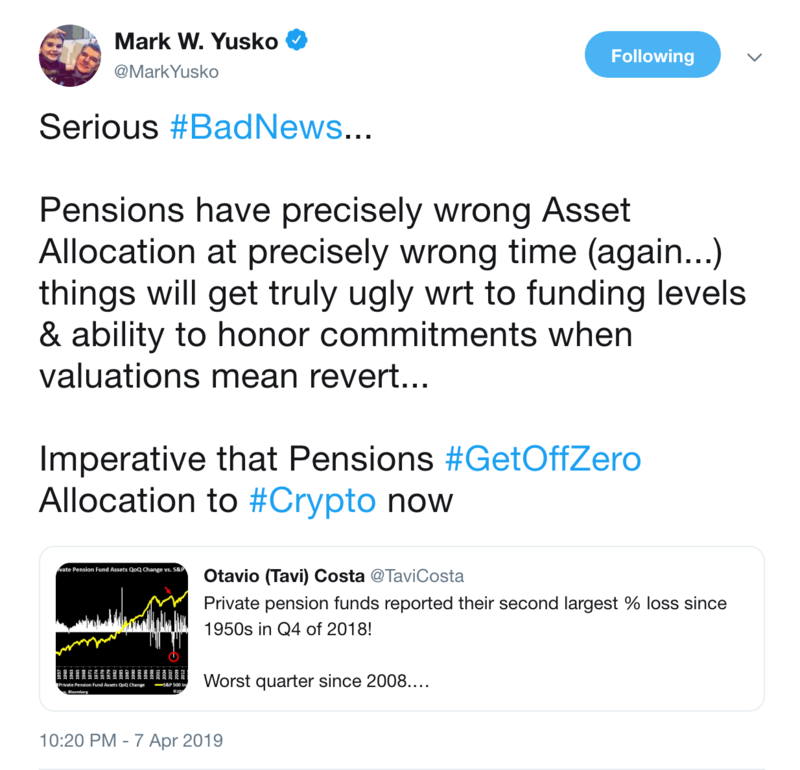 Additionally, adding the low correlation and asymmetric nature of Bitcoin and crypto to these pension portfolios should actually decrease the portfolio’s risk profile, rather than increase it based on modern portfolio theory. We are at an important moment in time — the retirement funds of tens of millions of Americans are in significant danger and it is important that capital allocators understand the benefits that Bitcoin and crypto present. These people have been promised there will be money waiting to support them in retirement as long as they work hard and do their jobs. The people have upheld their end of the bargain…it is important that the institutions now deliver on their promise. Rather than running from innovative technology, the best investors in the world (Yale, Stanford, MIT, Notre Dame, UNC, etc) are embracing Bitcoin, cryptocurrencies, and blockchain technology. Hopefully the majority of investors follow suit before it is too late. Bitcoin Exchange Kraken Sued by Former Trading Desk Manager: A former employee of Kraken, one of the oldest Bitcoin exchanges, is suing the crypto platform for allegedly failing to pay him for work he did. Jonathan Silverman, who was hired in April 2017 to manage Kraken’s institutional sales and trading desk in New York, is demanding compensation in excess of $900,000, according to a suit filed April 4 in New York. That’s based on an agreement Silverman says he reached with Jesse Powell, the San Francisco-based exchange’s founder, who offered him a $150,000 salary and orally agreed to pay him a 10 percent commission of the trading desk’s annual profit. Read more. SEC Guidance Sparks Fear and Loathing in Crypto Industry: When the Securities and Exchange Commission this week issued guidelines for cryptocurrency companies that want to sell digital tokens, many in the industry praised the SEC for new regulatory clarity, but also privately seethed the agency had gone too far. “This feels like an overt declaration of war on cryptocurrencies,” said a senior lawyer who advises crypto firms. “The guidance is terrible but people say ‘we have to say nice things or they’ll prosecute us.’ Everyone is afraid the SEC is full of thin-skinned bureaucrats, and now they’re so used to groveling.” Read more. Blockchain Mortgage Tech Startup Acre Software Raises $6.5 Million: United Kingdom startup Acre Software raised about $6.5 million to apply blockchain technology to the mortgage and insurance application process for advisers. Nearly three-quarters of UK mortgages are facilitated by advisers, and the company aims to help them retain their position by matching the speed of an end-user service. Acre reportedly uses blockchain to store all the data about mortgage advice immutably. Read more. Barclays, RBS, R3 Cut Property Transaction Times in Blockchain Trial: Barclays, Royal Bank of Scotland, enterprise blockchain firm R3 and other participants have completed a blockchain trial that they say resulted in faster property transactions. The tech partner on the project, R3-affiliated Instant Property Network, announced Thursday that the trial used test data to carry out simulated property transactions over a distributed ledger system over a five day period. The effort, the firm said, demonstrated that the real estate buying and selling process could be reduced from more than three months to “less than three weeks.” Read more. If you enjoy reading “Off The Chain,” click here to tweet to tell others about it. Nothing in this email is intended to serve as financial advice. Do your own research.